From the Star Wars collection by Robe Factory. Star Wars Han Solo Hooded Fleece Bathrobe. From the Star Wars collection by Robe Factory. 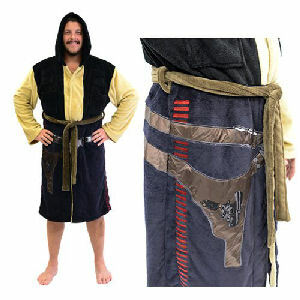 Star Wars Han Solo Hooded Fleece Bathrobe. The robe measures approximately 47 inches long and has 24 inch sleeves. One size fits most. Made of 100% polyester fleece. Machine washable. Robe Factory Star Wars Attire shipping from Canada. No Surprise Border fees or Customs!